Happy Hour starts around 6 both at our house and next door...at least five houses on the street are going crazy this year. Worth a trip for the kids alone: we usually give out around 300 pieces candy! Hey, look at all these videos on YouTube! Or these over here on Vimeo! This is just a little piece I threw together this morning as a salute to some of the people I have been working with at LA County. Kara Taguchi, Debbie Innes-Gomberg and the "Navigators" at LA County DMH won a statewide award for their innovative work in connecting people with services is this all-too-large county. Hats off to them! LA County DMH wins Challenge Awards 2008 from John Flynn on Vimeo. There are little pieces of work by two of my collaborators here: Karim Sahli of logicalnot did the opening and closing title animations (but not the lower thirds...his lower thirds are MUCH more interesting), and Gerhard Guter (website here) created the little sntaches of music at the top and bottom of the segment. These two see a lot more daylight in the large series of videos we have created for LA County's client population...I haven't really posted those online for various reasons (mostly having to do with privacy rights), but some of that will eventually show up online. I think this is also interesting because of the technology the Board of Supervisors have built for themselves in their hearing room. They are ofter called "The Little Kings." There are five of them, they lead a workforce of over 120,000 people, they are both legislative and executive, and they manage a government larger than all but a handful of U.S. states...it's a pretty staggering piece of political and financial real estate. Their hearing room is halfway to a TV studio. I think I counted 8 fixed/robotic cameras when I was there, and of course everything you see here is produced live and aired online and on KLCS. Party Party Demo from John Flynn on Vimeo. The wonderful and amazing Laurence Whiting and I got together a couple of years back to pitch a TV show we called Party Party!...but alas, I fear we were too naive. There wasn't enough greed, humiliation, and outright suffering in Party Party! for our show to survive the jungle that is Reality Television. As Martin Mull once opined, "I Haven't The Vegas Idea!" Still, what a weekend: I brought the camera crew and Laurence brought the party crew. We all danced and drank and ate like kings...and of course I managed to slip in a wonderful-but-obscure Elvis Costello theme song, and the always-amazing Kosh gave us some appropriately pulsating titles. John Luker and I have worked together for many years on all sorts of docs: he is a great cameraman and an invaluable traveling companion. There is NO ONE I would rather be out in the middle of nowhere with as we struggle with 2000 pounds of camera and lighting equipment. And he seems to be able to talk himself into and out of all sorts of things. He's been doing a lot of work related to Rocketdyne's Santa Susanna Field Lab and the mess there, and he's gotten sucked into Reality TV like so many people I know...but he takes pictures of everything. 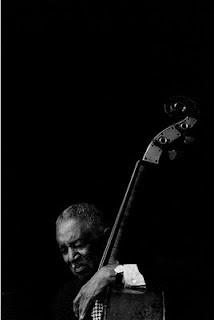 This one is the late, great Ray Brown: I have a print of it up in my study. John and I shot video and photos at the Lionel Hampton Jazz Festival for about 5 years...he taught me a hell of a lot about using the camera. His Flickr Photostream is amazing: pictures of music, nature, fire, architecture...you name it. Keeping it Real in Mayberry, L.A.
Well, the scale tipped about a year ago, and our lovely little ol' Culver City has now become Hip. God help us all! With the arrival of Rush Street, an otaku bar (RoyalT), Father's Office, Fraiche, and so on, the hordes of movie-going teens of two years ago have been replaced with hordes of what we used to call Yuppies. I don't know what to call them anymore: I guess the crowd is an amalgam of Foodies, Hipsters, Metrosexuals, and the like. Normally my kind of crowd: but en masse it's a bit much. Walking the dog on Sunday morning means walking around trash...and forget walking the dog downtown in the evening! And with the incipient (2010) arrival of the Expo Line, we're supposed to go high density. So begins the pushback by those of us who bought here when it was deeply unfashionable, built up the town, and are now in danger of being paved over. In this political season, a little political video for my friends at the Downtown Neighborhood Association. Scale Back 4043 Irving in Culver City from John Flynn on Vimeo.